IS JULIA Salazar a Jew? What is a Jew? Why does it matter? The reasons she intrigued the larger Jewish world were multifaceted: her unusual Sephardic “Latina Jew” identity; the affinity of Jews, both traditional and hipster, to Brooklyn (her district includes rapidly gentrifying parts of Bushwick, Williamsburg, East New York, Bedford-Stuyvesant and Brownsville); and the fact that not only was she Jewish but had been a Jewish professional – her last job being as staff organizer for the progressive group Jews for Racial & Economic Justice. But more importantly, Salazar is one of the first politicians to embody the new breed of far-left Jewish activist engaged in “Jewish resistance” politics. Uncomfortably for the Jewish establishment on the right, center and even the liberal-Zionist left, that includes embracing the DSA’s endorsement of the boycott, sanctions and divestment movement against Israel. So when Tablet Magazine published an article last Thursday documenting what it described as misrepresentations of Salazar’s political journey as well as her identity, the Jewish Twitterverse exploded with right-left sniping. While Salazar’s opponents called her a liar, her allies charged that the article author was engaged in a racist smear campaign that exposed the worst in exclusionary Jewish tribalism. . . .
A much more emotional dialogue is centering around Rosen’s questioning of Salazar’s Jewish identity – into which the Tablet article dove deeply and, some argue, too invasively. A few years ago I dove deeply into the many facets of Jew identity, producing podcasts focused on the “latina Jew” (AKA marrano) phenomenon as well as matrilineality versus patrilineality. In a nutshell, Jews deliberately create confusion about the nature of Jew identity because such confusion is good for the Jews. The fact is that Jew is a heritable trait. 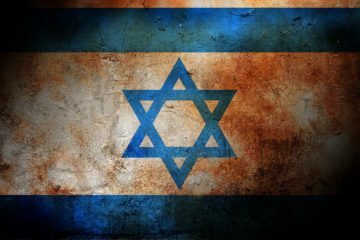 Throughout history the Jews have functioned as a multifaceted parasitic collective – infiltrating, manipulating, exploiting, and ultimately terminating a long series of hosts. What is Jew identity? A Jew named Rushkoff provided a good example of Jew mentality. Most Jews think similarly but mask it. Either way these congenital storytellers, who so freely sh** on everyone else, characteristically get very emotional about any scrutiny of who they are or what they’ve been up to. Salazar and her friends and allies have cried foul, saying the portrayal of her as a culture-appropriating Rachel Dolezal represents a tribal and racist view of “who is a Jew” from those who reject Jews of color, and those who claim Jewishness through patrilineal descent. The comparison to Dolezal is apt because Jewness is essentially genetic, i.e. racial, and though Jews know this, most insist on denying it. To compare Salazar to Dolezal is to acknowledge that Jewness, like blackness, is heritable. More than that, The Tribe, beside being the world’s foremost tribalists, are also unquestionably the world’s historic experts in passing, chameleon-like. Crypsis is their secret sauce, the technique by which they have so successfully infiltrated, manipulated, and exploited so many hosts to death. And it is also their nature to hiss when they suspect a weapon with which they are so adept might be used against themselves. If you want a view of completely Jewed political discourse, this is it. Everyone screeching as if they’re victims. This is intersectional Jewing. Left-posing “anti-racist” Jewing versus right-posing tribe-first Jewing. Heads Jews win, tails you lose. Despite the attempts to obfuscate, what’s going on here is not complicated. Some Jews screeched “imposter” at Salazar. Salazar and friends screeched “racism” back. Noticing that this line of argument was hitting too close to home, shining a light on the nature of Jewing, everyone is now lamely trying to shift the focus to anything but. Salazar’s Jewish identity is complex, says Ellman-Golan, and shows “all the ways we are and can be Jewish because we don’t fit into this neat little box as a complicated, diasporic people.” . . . In interviews and profiles, including in The Intercept, Jacobin and The Forward, Salazar identified herself as an immigrant from Colombia. She also identified as Jewish, and told The Forward’s Ben Fractenberg that her father is Jewish. Her identity as a Jew of Color, a socialist, and a proud critic of Israel made her the perfect avatar of a new, young, highly politicized Jewish Left engaged in the fight for social, economic, and racial justice. Tablet (where, full disclosure, I worked in 2013-2014) begged to differ. Reporters tracked down Salazar’s brother, who said that not only was Salazar’s father not Jewish, but Salazar was born in Florida. The outcry on Twitter was swift. But many have defended Salazar since the story broke, including many Jews on the left, who called the attempt to invalidate Salazar’s Jewishness racist. The biggest, most transparent lie here is this pretense that the controversy is about anything but Jewing. The Jewess writing this article, the professional Jews she cites, her Jew readers. All getting very emotional because . . . a politician lied. It’s appalling. A person’s identity — including their Jewish identity — is their own damn business. The problem with what Salazar did is not that she claimed to be Jewish and an immigrant. It’s that she may have misled voters while seeking public office. The problem is not whether or not Salazar is Jewish but whether or not she can be trusted. In other words, it’s not a question of ethnicity but one of character. The power of the Tablet piece lies not in the fact that it exposed Salazar as a non-immigrant and possible non-Jew; it’s that it exposed her as untruthful, which is a big problem for someone asking the public to trust them to have state power at their disposal. If Salazar had come out of the gate saying,“I consider myself Jewish, though my parents are not” or “I am a Jew by Choice” or “I traveled back and forth to Colombia as a very young child so I consider myself an immigrant” — a sentiment she tweeted in her defense — there would be no exposé here. If Salazar were a real Jew she would have known how to narrate her way through life as smoothly as a real Jew. In every other respect Salazar is an exemplar of Jewing. Her entire adult life has been spent arguing Jewy political issues from a Jew-centric point of view. Salazar has attracted the support of so many Jews, as Jews, exactly because they sense her Jewy spirit. Ms. Salazar was born in South Florida. She was raised in a Catholic home and her conversion story, which no one can verify, keeps changing. She never graduated from Columbia, unlike her mother, who in fact did finish college. She grew up in a comfortable middle-class home. She even has a trust fund. It’s hard to recall an instance where a candidate’s integrity was being openly challenged by her family more than by her political opponent. Ms. Salazar’s first instinct was to accuse Tablet Magazine, where I used to be an editor, of practicing “race science” when it cracked open the story in August about inconsistencies in her background and raised questions about her account of converting to Judaism. Once again, the concern about Salazar’s dishonesty is entirely Jewy. It begins and ends with the question whether or not Salazar is a biological Jew. If she were there would be no Jewsmedia controversy. Her Jewsmedia critics don’t care whether she lied about being poor or about being an immigrant. Julia Salazar has earned media attention that most state senate primary candidates could only dream of, including serious treatment in The New Yorker, and friendly profiles in New York magazine, The Forward, The Intercept, and Vice. Seemingly everyone in a half-mile radius of Maria Hernandez Park knows who Salazar is, while Dilan, who has served in the state Senate for the past 16 years, toils in obscurity. But Salazar differs from Ocasio-Cortez, Nixon, and the rest of her cohort in one interesting respect: the state Senate candidate is the only one to have emerged from a specifically Jewish corner of leftism. She “comes from a unique Jewish background,” as The Forward put it. “She was born in Colombia, and her father was Jewish, descended from the community expelled from medieval Spain. When her family immigrated to the United States, they had little contact with the American Jewish community, struggling to establish themselves financially.” From early 2016 through May of 2017 she was a Grace Paley Organizing Fellow with Jews for Racial and Economic Justice (JFREJ). Her fellowship biography identified her as senior editor of Unruly, the “intersectional blog” of the anti-Zionist and pro-BDS Jewish Voice for Peace’s Jews of Color and Sephardic/Mizrahi Caucus. Her last publicly listed job before running for office was as a staff organizer for JFREJ, which is a New York-based left-wing social and activist organization—Salazar was working with the group when it decided to honor the controversial activist Linda Sarsour with one of their annual Risk-Taker Awards. Going in reverse chronological order, Salazar has also been a contributor to Mondoweiss, an IfNotNow demonstrator, a Bridging the Gap fellow through Brooklyn College Hillel, a World Zionist Organization campus fellow, a co-founder of the Columbia University chapter of J Street, an AIPAC Policy Conference student attendee, and founder of the university’s Christians United for Israel (CUFI) chapter. For much of the five years leading up to her campaign, Salazar dedicated herself to explicitly Jewish causes, often in a professional capacity. If she wins, her identity as a politically radical working-class Jewish immigrant will have helped take her to a position of formal power and authority. Based on interviews with former acquaintances and an examination of her writings, social media postings, and publicly available documents, it is an identity that is no less convincing for having been largely self-created. Social media postings, various articles, and the recollections of people who knew her at Columbia University show that in her early 20s Salazar was a right-wing pro-Israel Christian. In 2012 and into 2013, she was the president of Columbia Right to Life, the campus’s leading anti-abortion group. . . . However Salazar identified politically, what is clear is that she brought the same passion and energy to whatever cause moved her. By early 2014, Salazar appeared to be presenting herself as a left-wing anti-Israel Jew, according to former acquaintances and social media postings. . . . If Salazar experienced a political change of heart these past few years, she is hardly the only one. However quickly she changed her mind about Israel, the trajectory of her views is a coherent one, and it runs in only one direction. But there are details in her biography that are harder to reconcile—including, though not limited to, her religious shift. That’s right. Before Salazar started posturing as a fervent “anti-racist” Jew she postured as a fervent pro-Israel Christian. This makes her recent claim that she didn’t “consider it a conversion [to Jew] because there was no religion for me to convert from” more intelligible rather than less. She didn’t think her “conversion” was a big deal because she’s always considered herself a member of Team Jew, and as “anti-racists” and Christians agree, identity is all in one’s mind. The Rosens dance around it, but they know otherwise. They understand religion serves as a cover for Jews. Likewise they know this fictitious conflict, over the Jew state or race or anything else, serves to disguise the deeper pursuit of whatever is best for Jews, as a people, not to advance some abstract ideology. The longer story is, as Jews like to say, more nuanced. According to Maria Emilia Naranjo Ramos, a genealogist with the Colombian Academy of Genealogy and Historic Academy of Córdoba, the Salazars have for generations been a prosperous family in Colombia that has played a prominent role in civic and political life. 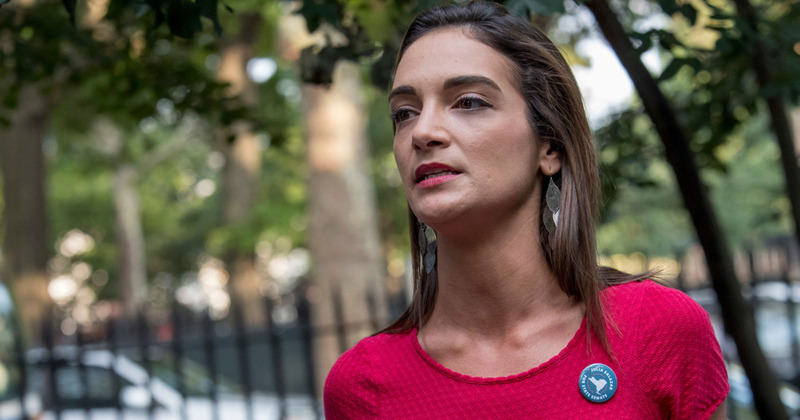 Far from being the daughter of struggling immigrants of mixed Jewish-Catholic religious heritage, which early news reports described her as based on her statements and those of her campaign, Julia Salazar is the scion of longtime Latin-American Catholic elites. “The Salazar and Grillo families have been recognized throughout their generations” for their roles in “public and political life,” Naranjo Ramos wrote in an unusual blog post diving into the Salazar ancestry (she doesn’t normally perform this exercise for living people) in response to the controversy in New York. The impetus for this unusual scrutiny is Jews, who seek to demonstrate that Salazar is not a biological Jew, because they understand that Jew is not an identity one can simply profess. Franke-Ruta consults a genealogist because she knows Jew is a heritable trait, and because she knows Spain was thoroughly Jewed. Salazar, a common Basque name, is one surname on the list of hundreds of names Spain released in 2015 as having possible Jewish ancestry, as part of an attempt at reparations by offering citizenship to anyone who could prove that they were descended from Jews forced to flee or convert by the Catholic monarchs of Spain. Most of those forced conversions took place in the several-hundred-year period that ended with the remaining practicing Jews being expelled from Spain at the end of the 15th century. That much is not contested. But it’s also a name that was adopted by Roma people in Spain during the forced taking of surnames in Castille, where the Salazars were a noble family, in the 14th and 15th centuries. And it is found in Latin America thanks also to the history of a group of Catholic Salazars who were deeply involved in the conquest of the new world. Still, the legacy of the forced conversions meant an entire people and culture was absorbed, and more than half a millennium later, about 20 percent of people who live in Spain and Portugal have genetic signatures suggesting Sephardic Jewish ancestry, according to a 2008 study. That’s probably true of some fraction of New-World Catholics of Iberian ancestry as well. I’ve pointed out the reality-inverting Jew-first Jew-serving nature of this sob story before. The Jews invaded and colonized the Iberians, whom they still see as aliens and despise for that reason. The Jews thrived at the expense of their hosts. Whatever else the genetic signature says it is testimony, again, that Jew is a heritable trait, that Jews are genetically distinct from others. As for the legacy of this colonialism, the many mogrelized sh**holes it produced both in Iberia and overseas, apologists today tend to misattribute this solely to “Catholic elites” and deny it had anything to do with Jewing. In their narrative the Jews were and can only ever be passive victims. Whether or not Salazar is some fraction biological Jew, it is the anti-White agenda and oppression narrative which has propelled her so far in politics. This agenda and narrative are entirely a product of Jewing. It is the only reason Salazar has the support of some Jews but is criticized by others. The cacophony of screeching around her is only the sound of one form of Jewing clashing with another. Rabbi: Jack "Ruby" Killed Oswald "For the Jewish People"
Why would the author (TANSTAAFL) of this article write a piece that is anti-Jew when he himself is married to one? Okay, so he’s a self-hating married-to-a-Jew type, we get it. But are we so utterly bereft of allies NOT married to Jews that have to use a traitor like this to promote our talking points? Well, others may be, but not I. TANSTAAFL is a Jew-lover, otherwise he would’ve dumped his Jew wife long ago. He didn’t, so we should dump him. Tanstaafl married a woman whose father was Jewish but who had no other relations with “Jewishness”. He married her before he became “Jew-wise” and he has two children with her whom he loves. You can’t expect him to throw that away. He has honestly confessed his situation and he desires no leadership in the pro-White movement because of it. His analyses of the Jewish mentality and behavior however are priceless and should not be rejected because of his situation. 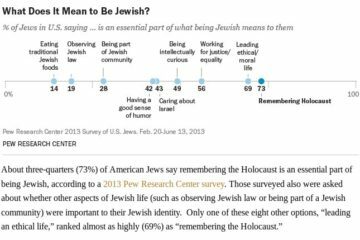 An interesting insight into Jewish identity politics, Jewish mentality and Jewish behavior. Any insights which allow us to understand and predict our enemies actions is good. When people understand what the bible says about this subject then maybe eyes will be opened to understand who these people really are and why they are so deceptive and power hungry.